When Hanan Abu-Laban, a charity director at the Ottawa Muslim Association, read a story about a woman in need on a local WhatsApp group, she knew she had to find a way to help her. Hanan, a Community Affairs and Charity Director at the Ottawa Muslim Association, has dealt with similar cases in the past. 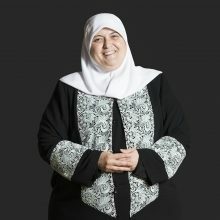 Over the last 15 years, she has devoted her time in Ottawa to assist struggling newcomers and established residents find their place in the community. Her community work has often focused on helping vulnerable families and single mother households to find the services they require, often to meet their most basic needs. “I knew Houda was alone, so I did a quick plan to move her closer to our community in Ottawa, so we could provide her with all support needed to make her new life better,” explains Hanan. In many ways, Hanan became the advocate that Houda needed. Houda has three very active young sons, one who experiences constant seizures. Hanan helped her find schools, daycare and specialized services for her sons.